Do you have an embarrassing food fetish? Something you more than love eating, but avoid telling anyone about. Because you know what happens when you tell them: they cringe, shudder, gag, and look at you with slight disgust at the thought of eating something you like. When I was a kid, I liked to eat corned beef straight out of the can. My parents and older sister convinced me to try it and I loved the flavor, but I hated when my mom mixed vegetables into the beef and when my sister put the corned beef in the oven toaster. For a while, whenever my mom had to make it for breakfast, she had to make it two ways: toasted in the oven toaster for my sister, and then from the can straight to my plate for myself. Years later, while I microwave my corned beef now because I prefer a hot meal, I can see why my sister was grossed out by my corned beef preference. I didn’t die, so I guess some people just can’t appreciate the flavor of different food. So, what about you? Maybe it’s a particularly stinky cheese. Or cold spam straight from the tin. Or a really awkward bit of an animal’s face – or another body part you’ll find in American Fear Factor episodes. Don’t worry, we won’t judge. After visiting Asia, I’ve discovered my new guilty pleasure. Ever since I came back and told people about it and the recipe I picked up, I’d see faces go from curiosity to disgust when I tell them my new favorite dish and that its name is exactly what they think it means. Do you want to know? Here goes: blood cockles. Specifically, my black hemlock blood cockles recipe. Here’s why I like it, a recipe on how to make it, and why it’s a good dish you’ll want to try. Blood cockles are also known as blood clams. Unlike your usual mussels, clams, or regular cockles, blood cockles have red-tinted meat from the high levels of hemoglobin. One bite of this morsel, and you could look like a wild animal with the red liquid that flows around your mouth. It’s not actual blood, though, so don’t be worried that you’ll taste nothing but the iron-like flavor of blood. In terms of flavor, it’s nothing like the salty clams you can get at your local seafood shack. From all various types of mollusks I’ve tried, the flavor reminds me of a crisp and succulent geoduck. There’s a hint of the salty seawater beneath its unique taste, but it’s not as salty. Where Can You Buy Blood Cockles? You can find them in Southeast Asia, Australia, and Japan. You might have to travel to these areas to taste blood cockles since importing them is banned due to health hazards. Blood cockles have washed ashore in New England in rare occasions and sold to various restaurants selling the delicacy. However, they’re sold at a much higher price than your average clams due to its rarity. 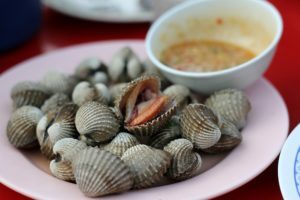 If you’re looking for an adventure, Thailand is one of the best places to go for blood cockles, or hoy kraeng, as they’re known in the country. Blood cockles are available in seafood restaurants around the country, but if you want to get a feel of everyday Thai culture, head down any soi (side-street next to main streets that aren’t exactly narrow enough to call an alley) in Bangkok and you’ll find several street food vendors serving blood cockles with dipping sauce. 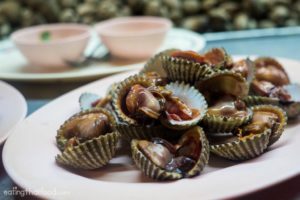 With the creativity of Thai food culture, I’ve found various local recipes using the block cockles as a star of the dish. But I found this recipe from a friendly vendor along one of the soi in Chinatown. While it is just a street food stall, there was bar counter seating available that my companion and I shared with a few polite locals who helped me understand what I was eating. Some people opted to eat the blood cockles raw after blanching it in boiling water for around half a minute, but the vendor was kind enough to explain what she had done with the cockles she served me. I like to call this recipe “black hemlock” because of the way the dark soy sauce mixes with the blood red of the blood cockle. With the bloody-looking clams and the black soy sauce, it’s intimidating to picky eaters and people who are unsure of the clam’s appearance, so of course a daunting dish needs a daunting name. 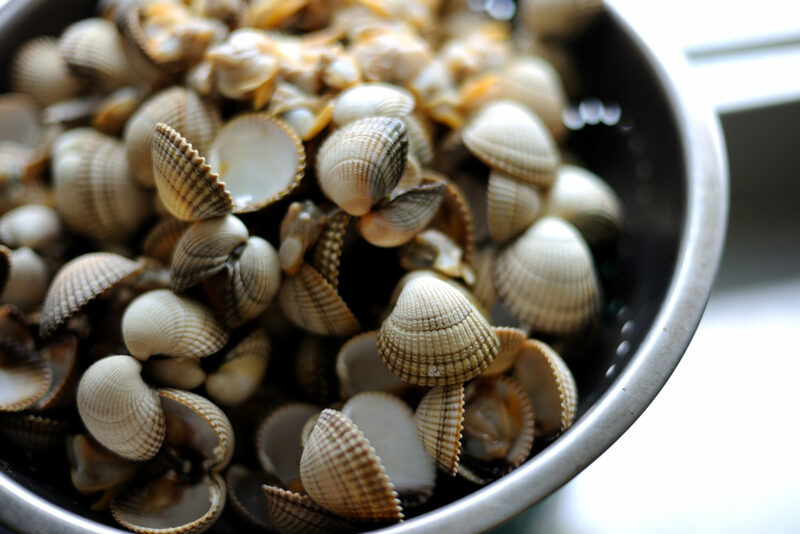 If you’re serving blood cockles as an appetizer, around 12 shells per person is enough. You’ll want up to a pound per person if you’re serving it as a main course. Like regular clams, blood cockles are a health risk when they’re not fresh. If you buy them in your market in the day, anything you don’t finish within the day may be spoiled the next day even if it is cooked. Also, only buy from a trusted seller, as unreliable sellers may be selling old cockles that have gone bad. Be careful when purchasing dark soy sauce. Light soy sauce may look similar to dark soy in a bottle, but when you pour both on a saucer, the light soy sauce has a brown appearance while the dark one stays consistently black. Dark soy sauce also has a thick and rich texture, is less salty, and has a deeper, more fermented flavor. Since it’s less used than light sauce, you might have to look at Asian specialty food stores for it. First, blanch the cockles in a tub of hot water. Soak and mix the blood cockles a few times to get it clean. You know it’s clean when you run it with tap water and the water remains clear. Mix all the ingredients together. The amount of chili, garlic, sugar, and lime you want to add depends on how you want it to taste. Add more chili for a spicier kick (or you might want to change the regular red chilies for something even hotter), or more sugar for a sweeter flavor. Taste the mixture to see if it suits you before adding the blood cockles. There should be enough of this to cover half or a third of the tub used to store the cockles. Leave the mixture to marinate overnight. Drain the soy sauce, and you have your black hemlock blood cockles: sweet, salty, with a little spice, over sour black blood. It’s not for the faint of heart, but those who can get past the name and its appearance will love the explosion of flavor. Back in Thailand, I had this blood cockles recipe over a bowl of plain rice congee. 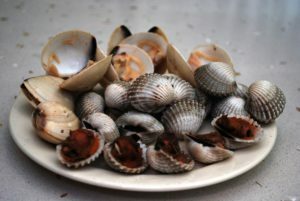 I recommend shelling the cockles quickly, one after the other, and chucking them into the bowl instead of shelling the cockles with every bite. It’s also very easy to make and adds to the experience of eating Thai cuisine. For every cup of white rice you’re cooking, add around 10 to 12 cups of water. Combine both in a pot and bring the water to a boil before reducing the heat to a low simmer. Leave it to cook for 20 minutes – do not stir! If it’s not soft enough for you, continue to let it cook and check for its consistency every 10 minutes. I know I’ve already said this, but it’s important to note whether you’re buying blood cockles cooked on the streets of Bangkok or making it at home: buy fresh blood cockles. 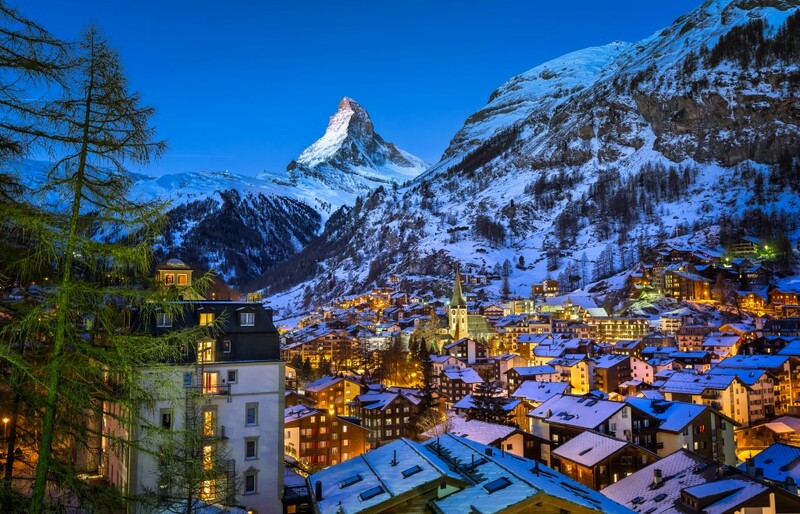 The locals had a term for it – tong sia – which means a rotten stomach (diarrhea) when people get stomach aches because of eating blood cockles that have gone bad. After marinating overnight, try to finish all the clams you’ve made by lunch. By dinner, you’ve got a high chance of a tummy ache. Also, feel free to try cockles on its own before adding it to the soy sauce marinade. It’s safe to eat after blanched properly in water, and eating it on its own can help you understand the base flavor and find other ways to use its flavor in other dishes. While it sounds exotic and dangerous, this blood cockle recipe promises a lot of flavor for anyone brave enough to try it. Are you brave enough to try the black-blood? If you’ve tried it, let me know what you think in the comments! Going With My Gut is all about letting yourself go wherever the wind takes you. 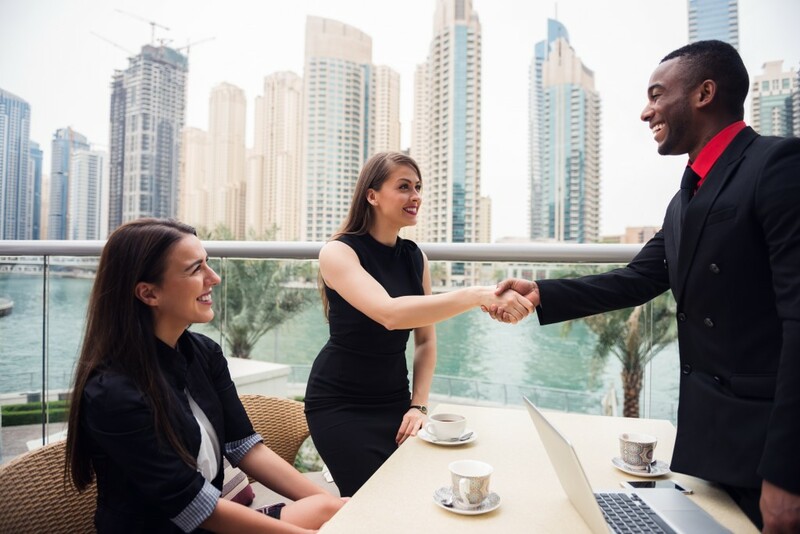 We are an online travel blog that promotes spontaneous adventure, but also responsible tourism to create a better and safer world for travellers.